Record numbers of student nurses have been offered careers working for a major teaching hospital in Yorkshire. 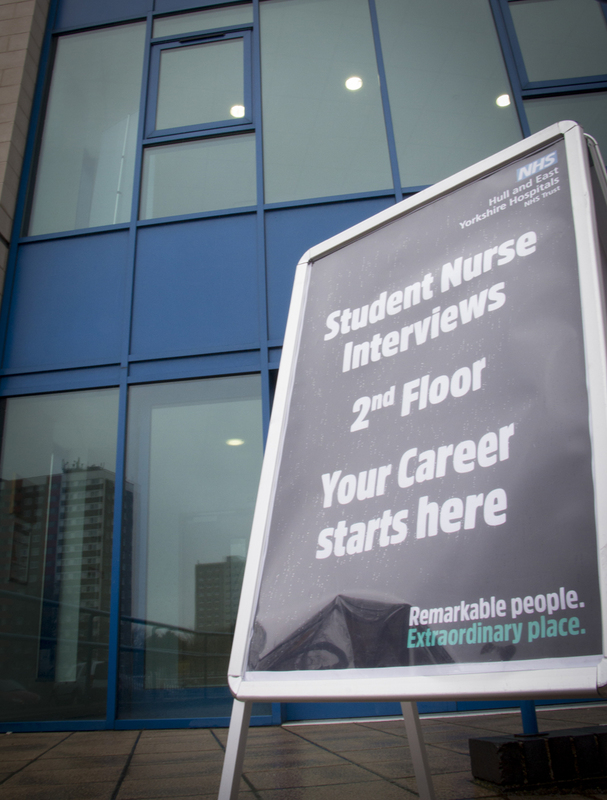 Hull University Teaching Hospitals NHS Trust is interviewing 165 student nurses this week as part of its Remarkable People, Extraordinary Place recruitment campaign. 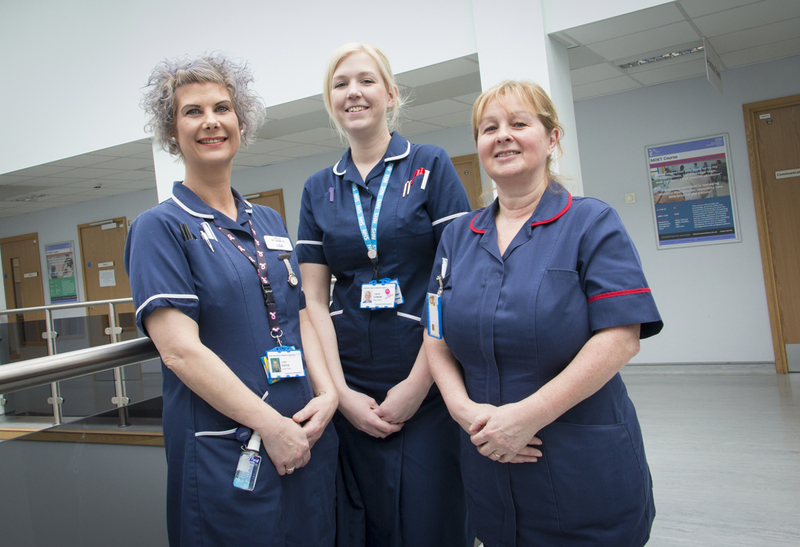 Despite a national shortage of around 40,000 nurses, the trust is on course to hire record numbers of newly qualified nurses in 2018/19 to boost existing staff levels at Hull Royal Infirmary and Castle Hill Hospital. David Withers, the trust’s head of education, said: “We are interviewing 165 students for adult nursing roles, around 50 more than we interviewed last year. “Although the majority are from the University of Hull, we’ve also attracted applications from students in Leeds, Lincoln, York, Sheffield, Manchester and Tees-side. “The response to our recruitment campaign has been phenomenal and we’ve been really impressed by the high standard and calibre of the students who have been selected for interviews. Hull students Sharon Sanford, Emma Farr and Sophia Taylor were offered jobs after attending interviews this week. Emma, 32, worked in a bingo hall before embarking on a three-year nursing degree and has now been offered a job following her successful interview. She said: “My family is here, I live here and all my student placements have been here so I wanted to work here. Sharon Sanford, 46, was an account manager at KCom before pursuing a career in nursing. She has been offered a nursing post. “It was a mid-life career crisis for me,” she said. “My children are older so this is the ideal time for me to focus on my career and what I want to do. Sophia, 22, is aiming for a career in intensive care or cardiac nursing after her successful interview. “I lost my mother when I was 11 and one significant thing I remember through the bad times was the quality of nursing,” she said. “She had district nurses and spent a long time in Hull Royal and throughout that time, her care was great so that’s why I wanted to become a nurse. As well as rewarding career pathways, the trust will pay bridge fees for students living in the south bank for the first year and offer relocation packages for students living further afield. Four interview panels featuring nurses already employed at different levels in the trust will conduct the interviews this week, with successful candidates notified within 24 hours. To take up the job offer, students must submit their dissertation and pass their final exams at the end of their three-year degrees. They will be hired by the trust as Band 2 health care assistants until they receive their nursing PIN numbers from the Nursing and Midwifery Council, allowing them to familiarise themselves with their new working environment and start earning. New recruits will benefit from a fully-supported “Let’s Get Started” induction process as they put their academic skills to practical use working alongside fully qualified staff on the wards, theatres and departments. They will also be offered six-monthly rotations in different specialities to give them the opportunity of experiencing a variety of nursing roles before they choose a particular career route. Mr Withers said: “Students who join our trust get the added benefit of experiencing a role they may not have considered previously.